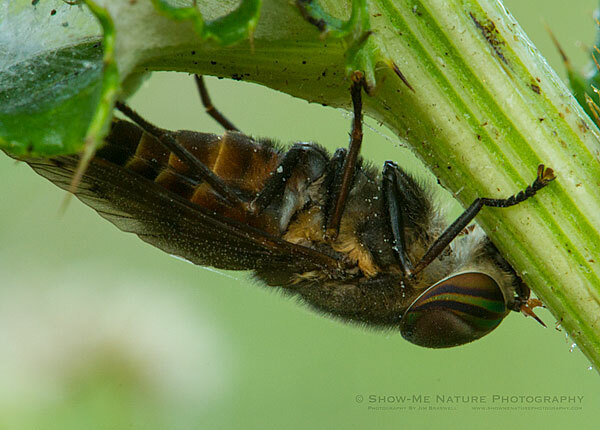 Today’s post features what I believe to be a Robber Fly, hanging upside down from the underneath side of a wildflower leaf, at the local Missouri prairie. I’m pretty sure this is a Robber Fly, but not totally sure. It was very difficult to see the entire insect, underneath it’s foliage cover, but I have seen a few Robber Flies on this prairie in the past. 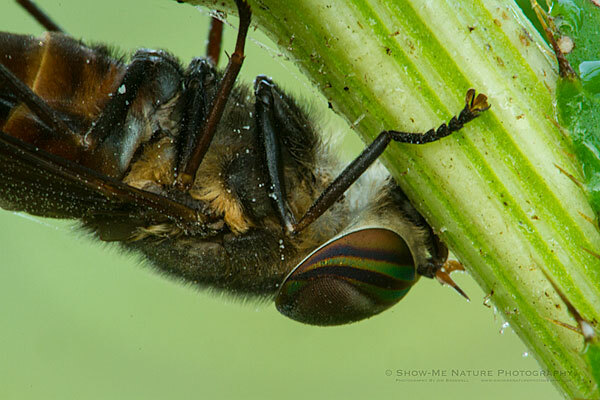 I think these images illustrate why macro photography has become so much fun for me … being able to see the very unique and unusual details of the subject. Just look at those eyes and the coloration … and the details of the legs. Amazing! Tags: 2013, behavior, Blog, Cass County, fly, insect, macro photography, meadow, Missouri, nature, nature photography, photography, prairie, summer.